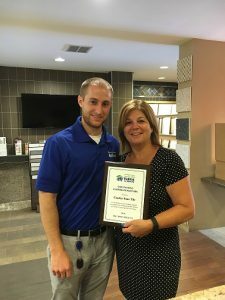 Habitat for Humanity (Burlington County, New Jersey) awards Garden State Tile for being an outstanding corporate partner. A special plaque was presented to Christy Iacometta, Training and Development Manager, on behalf of Garden State Tile. The continued support from Garden State Tile helps eliminate poverty housing not only in Burlington County, NJ, but also around the world.